With the latest versions of 1Password, Dashlane, Keeper and LastPass, users no longer have to rely on Share Sheets — or switch between apps — to fill in password text fields found while browsing the web or in apps that require authenticated logins. 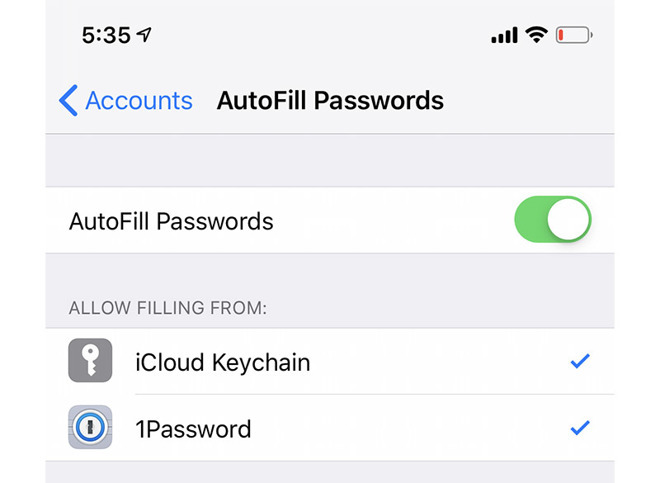 Previously, Password Autofill was restricted to iCloud Keychain, but newly added functionality in iOS 12 allows integration with third-party password managers that implement a credential provider extension. In practice, the new feature makes information from password managers easily accessible from any app that supports the system-level feature. For example, users can apply information stored in third-party apps to fill in online login forms presented in Safari. To enable Password Autofill, navigate to Settings > Passwords & Accounts and activate Autofill Passwords. Users can then select which supporting password management apps to enable for autofill duties, including iCloud Keychain. Once activated, users are able to access password credentials in supporting apps by tapping on Password Autofill — a small key icon that appears above the soft keyboard — and selecting information from a desired service. The device authenticates its user via Face ID, Touch ID or PIN code prior to filling in provisioned text fields, such as user name and password. Password Autofill support for third-party apps is one of many new features included in Apple's iOS 12, which saw release earlier today. The next-generation operating system incorporates marquee features like life management tool Screen Time, advanced augmented reality functionality via ARKit 2.0, Memoji for iPhone X, Siri Shortcuts and more.